Grew Up… in Arkansas. After his father ditched town and his mother committed suicide, Dangle went to live with his uncle Frederick. Profession… formerly member of the U.S. Coast Guard. 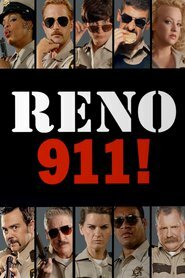 Dangle is now the highest-ranking officer in the Reno Sheriff’s Department. His main managerial duty is to keep the daily morning meeting running smoothly, which it rarely does. Interests… music. Dangle loves musical theater, the singer Morrissey and the band Rush. He plays the guitar and harmonica, often goes into schools to sing educational songs like “The Two Dads Song.” Maybe “Mr. and Mrs. Mom both have penises” isn’t the most appropriate lyric for elementary school students, but it promotes a message of tolerance. Relationship Status… divorced. Dangle, who is bisexual, was once married to a woman named Debbie. During the marriage he had an affair with Deputy Wiegel, and they have been friends with benefits ever since. Although Dangle mostly does it for Wiegel’s benefit, out of pity. He describes her as “crazy” and “an unfortunate-looking woman.” Dangle constantly hits on Deputy Jones and once was able to successfully seduce him when he invited him over under the pretense of helping him move. Challenge… maintaining his cool in a stressful job. He’s been seeing a therapist for over twenty years and has been known to indulge in the occasional Merit 100 cigarette. What torments Dangle most is that his precious bicycle is constantly being stolen, vandalized, and/or tampered with – acts usually perpetrated by Deputy Junior. Personality… easily irritated, passionate about his job, and the most responsible member of the Reno Sheriff’s Department (though only by a little). He respects authority and goes out of his way to impress FBI agents when they come into the office. Jim Dangle's popularity ranking on CharacTour is #2994 out of 5,000+ characters. See our top-ranked characters and read their profiles.